The Notification Condition feature enables you to automatically receive push messages on your smartphones when specific conditions that you have defined are met. Set conditions. Tap on the desired parameter (e.g. Temperature) to enter its detail mode and find ‘Notification Condition’. Then, select the desired level (if relevant), choose ‘Above’ or ‘Below’ (‘Move’ or Stalled’). Once a condition is set for a given parameter, the yellow appears on the dashboard. Webhooks are a great tool to integrate smart devices and web services with each other and build automation rules. 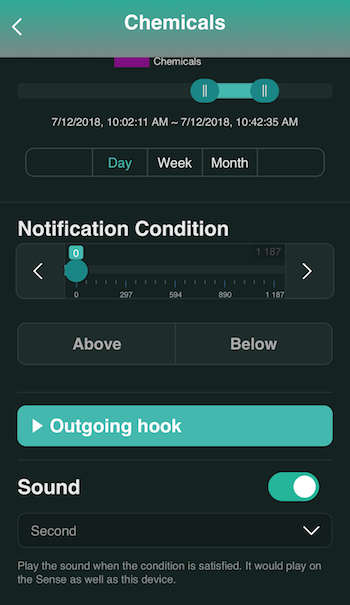 Alert supports both Incoming hook and Outgoing hook. 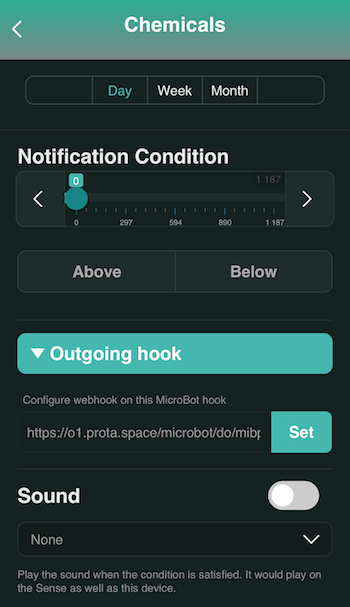 For example, you can integrate your MicroBot Push with MicroBot Alert using webhooks. The device or web service you want to integrate must support webhooks. If it does not support webhooks, use IFTTT's Webhooks service (Maker). You will need an IFTTT account. Principle. If the condition you’ve set using the Condition Notification feature is met, Alert posts an HTTP request (outgoing hook) to the other device or service. For example, if MicroBot Alert detects that the light intensity is below 5 lux, MicroBot Push turns on the light. Get the webhook URL. 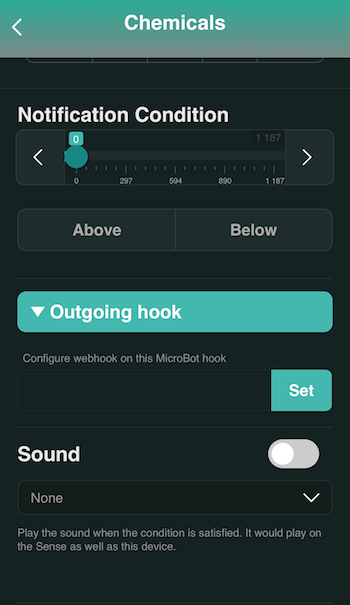 Find your smart device's or web service's incoming hook URL, copy it and go to the MicroBot Alert app. Set the condition. tap on the desired parameter (temperature…) to enter its detail mode, and set the Notification condition. See above for more details. Set outgoing hook. 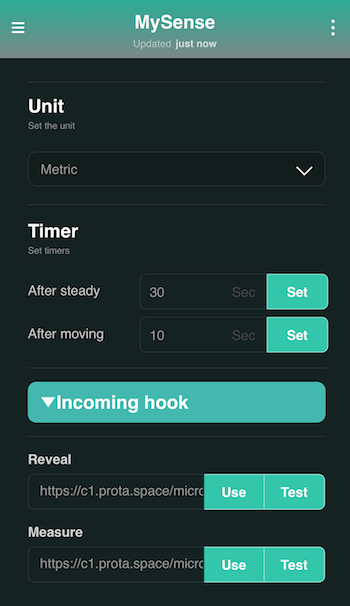 Tap on ‘Outgoing hook’, paste the URL (incoming hook) that you retrieved from another service or smart device, and tap on 'Set' button to save. An action on your smart device or web service will be triggered when MicroBot Alert detects a preset condition. Note: A condition must be set using the ‘Notification Condition’ feature before using outgoing hooks. Principle. If a specific event occurs, it will trigger MicroBot Alert. The action triggered depends on the type of incoming hook chosen for the automation. Reveal: MicroBot Alert’s LED will blink in different colors to enable you to spot it. Access incoming hooks. Tap 'Detail' button at the top right corner to enter your Alert’s settings, find and tap on ‘Incoming hook’. The URLs of Alert’s incoming hooks appear. Use incoming hooks. Tap 'Use' to copy the incoming hook URL of your choice and paste it in the webhook settings of the smart device or web service you wish to integrate. MicroBot Alert will be triggered when a particular event occurs. In addition to the Push notification, it is possible to get a sound alert if the condition you have set is met. Set sound alert. Turn on ‘Sound’, choose your preferred sound alert and exit the detail mode.